I've been feeling awful the last few days, and I'm pretty sure I'm coming down with a cold. I woke up Monday morning with a sore throat and it's still here today. Thankfully it hasn't gotten any worse! I'm all hopped up on cold medicine, so if I sound incoherent please forgive me! Seriously, I've taken this medicine dozens of times before, but this time around it makes me so loopy! So the fact that I feel so gross coupled with the piles of new snow we get every night makes for lots of time snuggling on the couch in pajamas (which also means no outfit posts or adventures for us to document). Here's a silly post for you instead! I had a random box laying around for a while that I thought I'd need to ship a big Etsy order, but I was able to use a smaller box instead. I I had taped together the bottom flaps, and then sorta just left it by my 'shipping station' (aka our kitchen peninsula counter). Mr. Littlejeans had been having fun hopping in and out of it, but then Chris had a stroke of genius and transformed a regular cardboard box into a little home for Jeans! Surprisingly, Jeans loves it, and actually hangs out in it a lot. 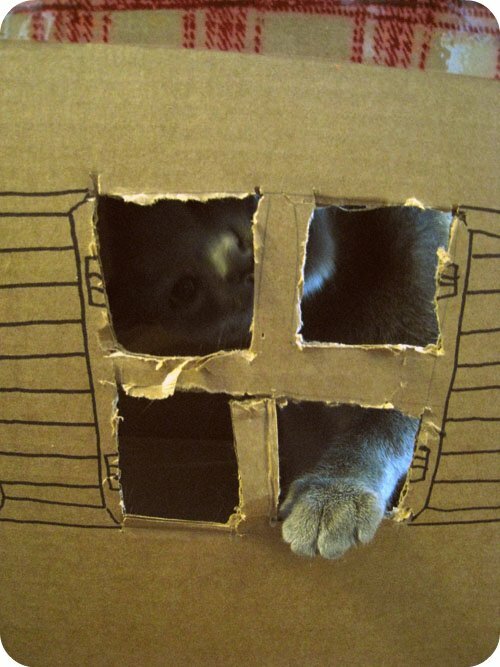 He keeps putting his toys in it, and his favorite part is sticking his arms out through the windows! This is ridiculous and pretty funny! Haha! Love this and all the little homey touches! Especially the welcome mat. So so so cute! 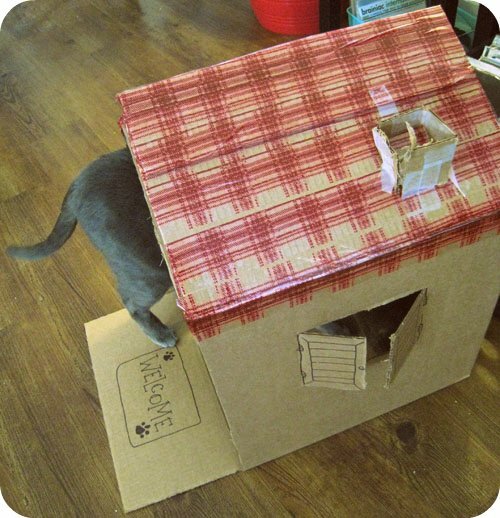 What a creative idea/use for that box, I especially love the welcome mat with little paw prints! lol oh my gosh! 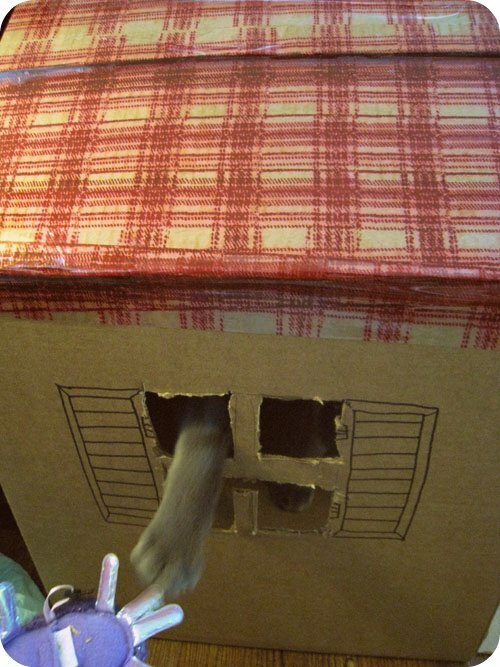 i just made my cat a house out of a cardboard box recently, no joke! 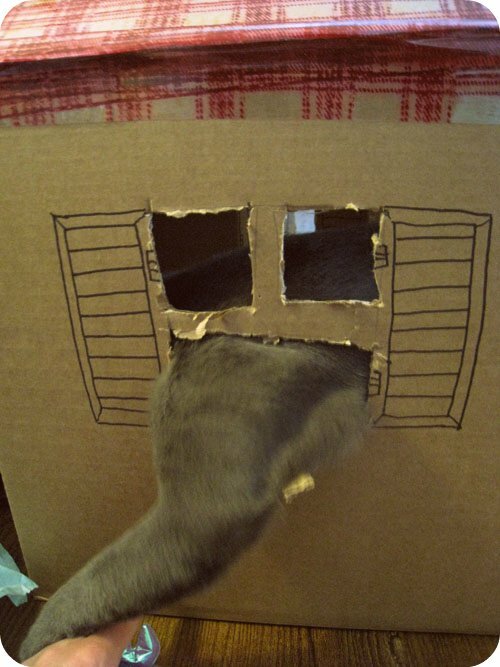 bahahahaha that cat house is amazing!!!! You're trying to kill us with cuteness overload! haha aww, I love watching kitties play in boxes/bags/dressers/pretty much anything that could fit a cat. Hope you feel better soon and bah at the snow! Haha, this is amazing! The Jeansy hulk picture made me laugh so much. I hope you're feeling better soon. Haha, this is so cute. 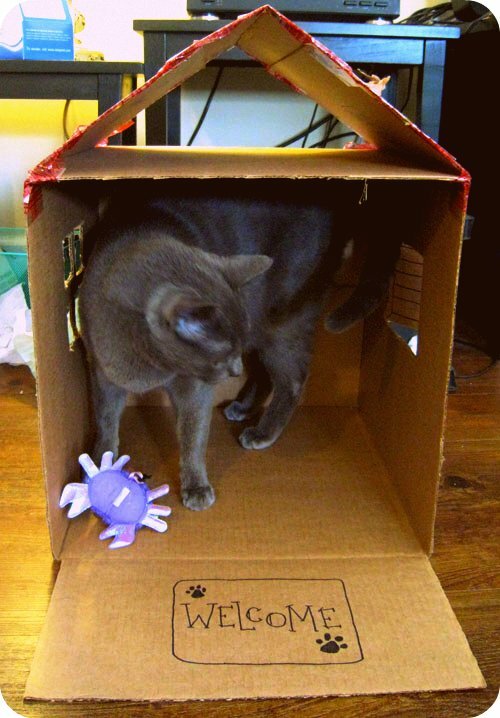 I wish I had a pet to make houses for! Too cute! i might make a little itty bitty one for my hamster! This is adorable! 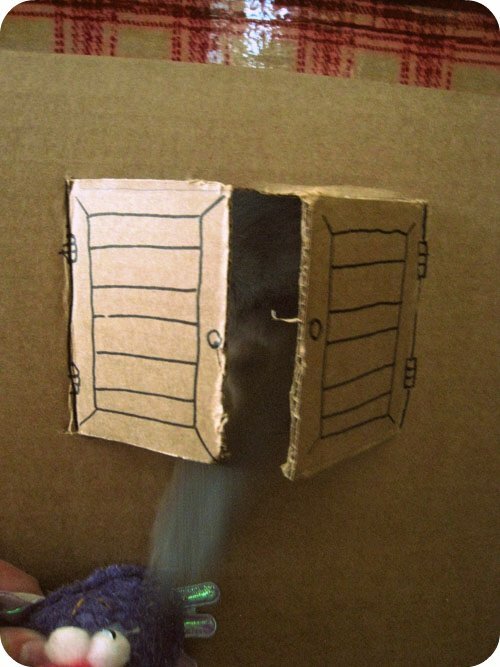 I want to make one for my kitties. hehe cats are just too curious with new things, even more so with boxes or luggage cases! @Paul: I did! I'm writing back slowly! oh my.. what a cute idea!